(Bloomberg) -- Equity strategists on Wall Street are all rates traders now. As earnings from America’s biggest banks continue to roll in, a macro backdrop favoring global growth and higher rates -- not the bottom-line results -- is inspiring analysts to amp up bullish calls on financial stocks and suggest caution on utilities. Green shoots in China’s economy and signs of U.S. resilience in the first quarter have investors dialing back bets on policy easing from the Federal Reserve in 2019. The 10-year Treasury yield has jumped 20 basis points from its lows of the year, putting its rate back above those of three-month bills to cure a so-called inversion. The bond market is sending a message for equity investors looking to take a stance, strategists have concluded. On Monday, Wells Fargo Securities head of equity strategy Christopher Harvey delivered a double upgrade on diversified financials -- to overweight from underweight -- while concurrently lowering utilities to underweight from neutral. The moves are two sides of the same coin, he notes. Diversified financials -- which includes traditional investment banks, asset managers, exchange operators, though not the biggest money-center banks -- have been battered by sinking yields and a flat curve and now look attractive. That’s in contrast to defensive-oriented yield plays like utilities, which have “already benefited from ‘low for longer,’’’ Harvey writes. Cuts to earnings forecasts for financials leaves “a more beatable bar,” when companies report results, he points out. Only a handful of firms in this subsector have issued their first-quarter figures, but two-thirds have exceeded expectations. 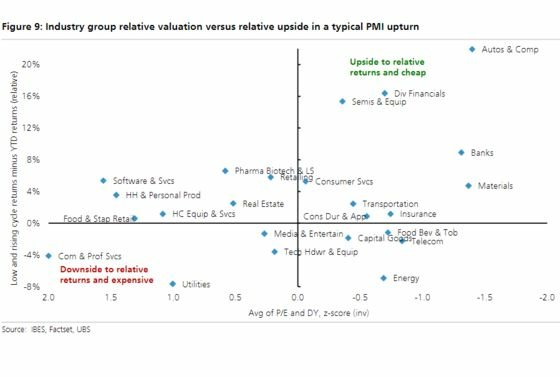 A fourth-quarter global growth scare, market rout, and lingering desire for safe stocks has fostered an extreme valuation gap between financials and utilities, observes Savita Subramanian, the chief U.S. equity strategist at Bank of America. 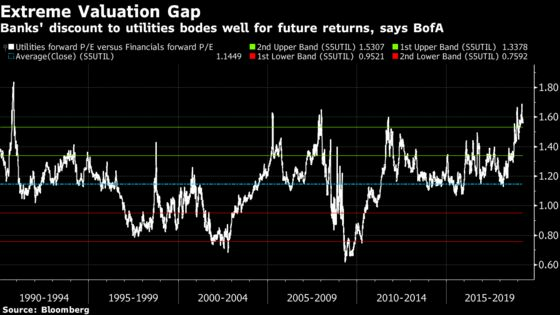 The forward price-to-earnings ratio difference between utilities and financials is more than two standard deviations above its long-term average. Betting on a reversion has returned nearly 20 percent over the following year, on average, during the eight instances of such an extreme valuation gap since 1986, the strategist notes. At the end of the first quarter, Subramanian lowered utilities to underweight from overweight, citing elevated payout ratios, stretched valuations and limited upside unless 10-year Treasury yields continued to tumble. She kept an overweight on financials. UBS Securities head of U.S. equity strategy Keith Parker agrees that diversified financials are attractive and utilities pricey if global manufacturing purchasing managers’ indexes are in the early stages of turning up. 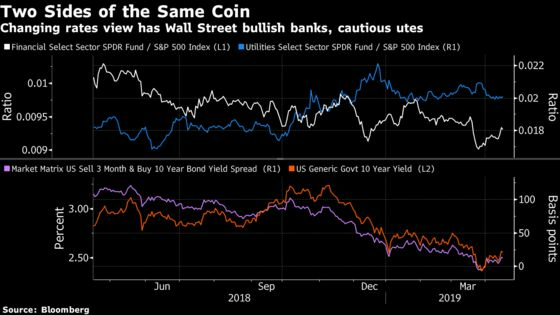 He also recommends that investors buy put options on the Utilities Select Sector SPDR Fund (XLU) that would be in the money should the ETF fall roughly 4 percent by mid-June. Downside of nearly 15 percent for the sector is possible over this stretch if investors allocate more toward riskier sectors as rates rise, he reckons. It’s “a macro call, not an earnings call,” he concludes.